A WARNING: THIS BAG IS A SUFFOCATION HAZARD. CARRIAGES, OR PLAYPENS. THIS BAG IS NOT A TOY. TO ADD AIR ON A DAILY BASIS. instruct children on proper use of this product. • Do not allow your child to attempt somersaults or stunts whilst on product. • Read all instructions carefully before assembly. • Only use under constant adult supervision. • NOT for adult use. • DO NOT allow children under 3 years of age and over 6 years of age. the product on a hard surface. 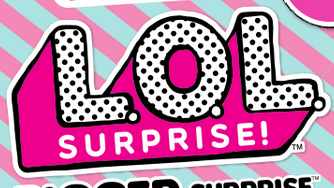 except for the items included in this package. and other hard surfaces before setting up the unit or playing in it. • Clean the item with a damp cloth. • NEVER use item outside during bad weather circumstances or thunderstorms. • DO NOT continue to use this product if any part is damaged or broken. • DO NOT leave the unit in any area where it might become damaged. that you separate all parts to expedite assembly. • DO NOT use this unit in a manner other than specified in instructions. they may cause a strangulation hazard. • DO NOT drag the unit, as it may cause irreparable damage. • Keep pets away from the product. • DO NOT leave children unattended at any time. • Allow only one child at a time. all risk of injury resulting from use. All merchandise is sold on this condition, which no representative of the company can waive or change. • Only adults must set up this product. 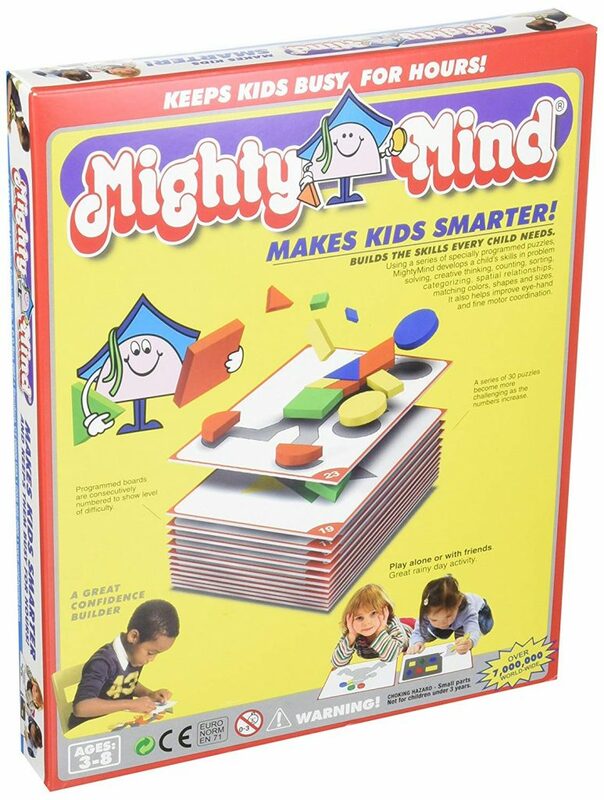 packaging for storage when finished playing. been cleared of all objects of any kind. which may cause the unit to slide or tip over. IMPORTANT: Before set up, check that you have all parts necessary for assembly. In addition, we recommend that you separate all parts to expedite assembly. 1. Carefully unfold item in a soft, flat and even surface which has been cleared of all objects. 2. Lift the air valve plug from the inflation/deflation opening on the edge of the unit. 3. Place the hose of pump (hose and pump not included) into the valve opening. 4. Turn the pump ON and inflate the unit. NOTE: Pump may be purchased at most hardware sporting goods store and other retail outlets. Some pumps have inflate and deflate valves. Follow pump instructions when attaching hose. from over-inflation. Inflation time will depend upon the type of pump being used. by pressing the plug into the opening firmly to assure there will be no air leakage. • Now repeat for the other remaining plugs. • Allow only one child at a time to play with the product. 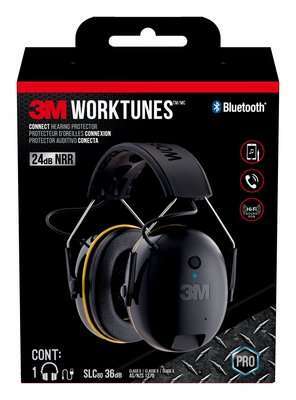 Must have a 2m (6.6 ft.) obstacle free zone around the product. ALLOW ONLY ONE CHILD AT A TIME TO PLAY WITH UNIT. /S\wARNING – Instruct the child how to play with the Dueling Snow Blaster. perform the following steps. Keep repair patches away from children. 1. Deflate the item, clean the punctured area with water and allow it to dry. area and smooth out any bubbles with a paper towel. 4. Allow the item to sit for 30 minutes before re-inflating. Repair Patch: Keep away from children. For Adult use only. A repair patch has been included with the product to repair small leaks and holes. 1. Remove the child from the unit. 2. Remove the plug from the inflation/deflation opening. 3. Allow the unit to deflate completely. deflated, press gently on the top of the unit to help air escape from the deflation opening. and cause bodily injury to the jumper. dry place away from children’s reach. DO NOT leave the unit in any area where it might become damaged. Cleaning Instructions: Surface wash with water only. Do Not use chemicals or abrasives. 1. Unit is intended for domestic family use only. Not for use in public areas or as a rental. 2. DO NOT use this unit in a manner other than specified in instructions. 3. Instruct children on proper use of the unit. 5. DO NOT drag the unit as doing so may cause irreparable damage. 6. 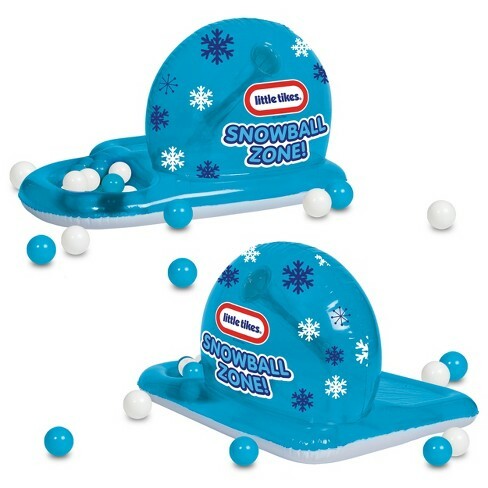 DO NOT place the Dueling Snow Blasters on hard surfaces, such as concrete or wood floors. 7. Allow only ONE CHILD at a time to play with the unit. objects or any clothing containing drawstrings before playing in the unit. 11. DO NOT allow child to attempt to climb on the wall as doing so may cause a tipping hazard. 12. Keep pets away from the product. 13. Maximum allowable weight of person using the unit 60 lbs. 14. Check the product during use and re-inflate as appropriate. objects and other hard surface before inflating the unit or playing in it. 16. DO NOT leave children unattended at any time. 17. DO NOT use as a flotation device. Near swimming pools, any body of water, or snow. 18. DO NOT use with persons under 3 years of age and over 6 years of age. 19. DO NOT use on or near stairways, hills, driveways and roadways. 20. DO NOT dive on or jump off of item. 22. DO NOT use electric air pump if water or moisture is present. This may result in electric shock. 23. NOT FOR ADULT USE. © 2018 Better Sourcing Worldwide, ltd.
may vary from photos depicted on package. Keep content details for future reference. or RESUME me from hibernation. walk,sit down or stand up. will be full and stand up to dance. 1 .Switch off the puppy. socket on the USB(fig.8). Insert the USB plug into the USB socket,the charging indicator turns on,the charging process begins(fig.9). 2.Unplug the charging plug after the charging indicator turns off.Charging is completed. 10-15 minutes for it to cool down. -DO NOT pick up moving puppy. -Keep hands,hair and loose clothing away from the legs when power switch is turned ON. -Remove battery from the toy when not in use. household waste. Batteries are harmful to health and the environment. collecting points. This way batteries are recycled safely. -Non-rechargeable batteries are not to be recharged. -Rechargeable batteries are to be removed from the toy before being charged. -Rechargeable battery are only to be barged by an adult. -Only batteries of the same or equivalent type as recommended are to be used. -Batteries are to be inserted with correct polarity. -Exhausted batteries are to be removed from the toy. -The supply terminals are not to be short-circuited. -Always remove batteries from the toy when it is not being used for a loiig period of time. -Wipe the toy gently with a clean damp cloth. -This toy is intended for indoor use only. -Do not submerge the toy into water that can damage the electronic assemblies. -Parental guidance is recommended when installing or replacing batteries. -Users should keep and retain this information for future reference. -Users should keep strict accordance with the instruction manual while operation the toy. I’ll tell you the time! This activity allows your child to learn how to tell time through discovery and exploration. 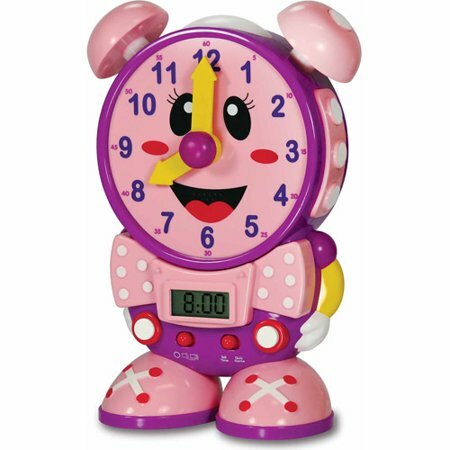 • Turn the clock hands to any time, and Telly the Teaching Time Clock will announce the selected time. The minute hand can be moved in 5 minute intervals. This activity asks your child to identify a specific time on the clock by moving the hands to the time selected. • When this activity is selected, the unit will ask a random set of questions. • To select the correct answer, turn the clock hands to the correct time. The unit will confirm whether or not the answer is correct. • If the answer is correct, a positive statement will be made and a new question will be asked. • If the question is answered incorrectly three times in a row, a new question will be asked automatically. On/Off/Volume Button – Use switch to turn the unit on and off and to adjust the volume (high or low|. Play Mode Selector – Move the switch to select one of the two activities. Digital Display – When the unit is off, and the time is set, this display shows the time. When in an activity mode, this display shows the time being taught. Movable Clock Hands – Move the clock hands to activate the time-telling function. Turn slowly to avoid damaging internal components. Night-Light – Push down on the light to turn it on for nighttime comfort. Push down again to turn off. Night-light will turn off in three minutes. Carry Handle (on back of unitl – Use this handle to make Telly the Teaching Time Clock more portable. Battery Compartment (on back of unitl – Located on the back of the unit. Set Hour Button – Use this button to set the hour. Set Minute Button – Use this button to set the minute. Use hour and minute buttons to set time. Press and hold the hour or minute button until display flashes. Then push the buttons down until correct time is displayed. Time is set when the display stops flashing. the problem may be low battery power. If this is the case, install a new set of batteries before using. • Turn hands slowly to avoid damaging internal components. comfortably so they don’t lose balance. 2. Hold firmly with both hands and look forward. movements to ensure balance and confidence. 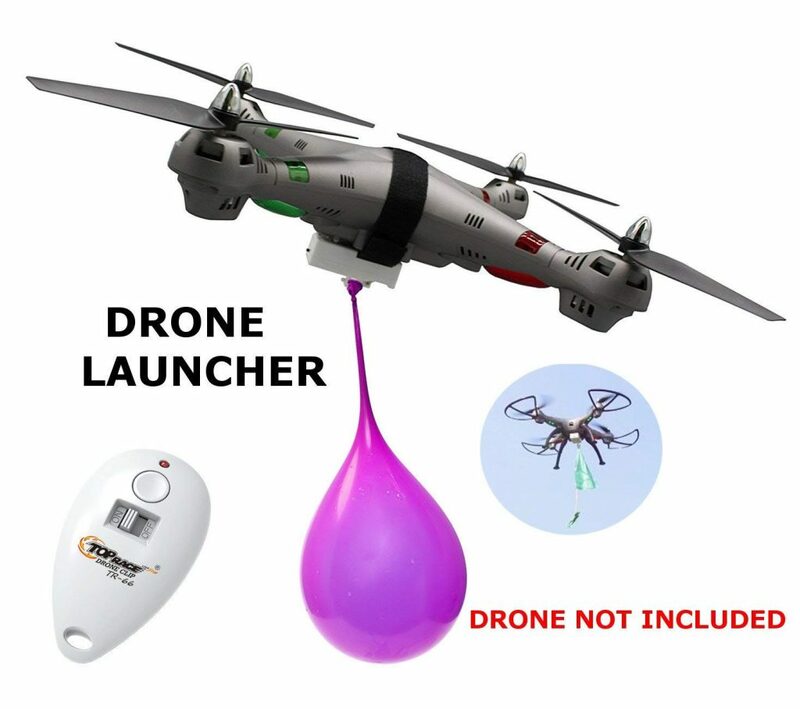 USE OF THIS TOY. PLEASE READ AND SAVE THESE INSTRUCTIONS BEFORE SETUP AND USE. KEEP THESE INSTRUCTIONS IN A SAFE PLACE FOR FUTURE REFERENCE. ADULT SETUP IS REQUIRED. Keep away from heated surfaces. soap or any cleaning chemicals. and not as a personal flotation device. • Do not use a high-pressure pump to inflate. needed (Adapter not included) which comes with most air pumps. B. Pump until inflated to a maximum of 18″ diameter. into the hole quickly and firmly, the hopper is then ready to use. TO DEFLATE: Remove the stopper from the hole. Press ball flat and fold for storage. 1. DO NOT LET ANYONE UNDER THE AGE Of 4 USE THIS PRODUCT. adults should instruct children on proper use of this toy. watches, etc. from person and pockets. A CAUTION: DO NOT ©VEi INFLATE. 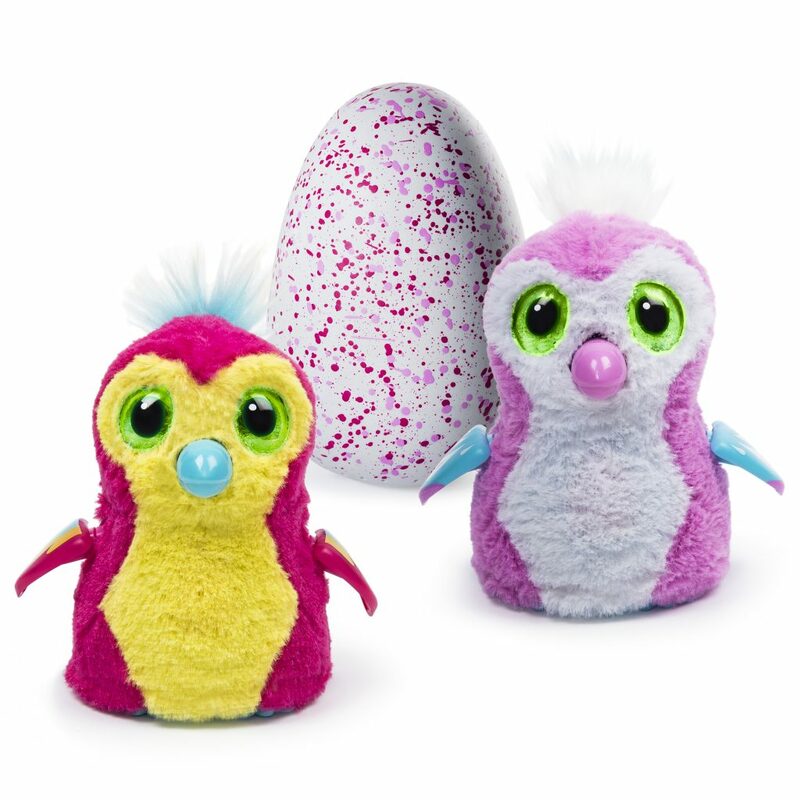 © The Little Tikes Company, an MGA Entertainment company. 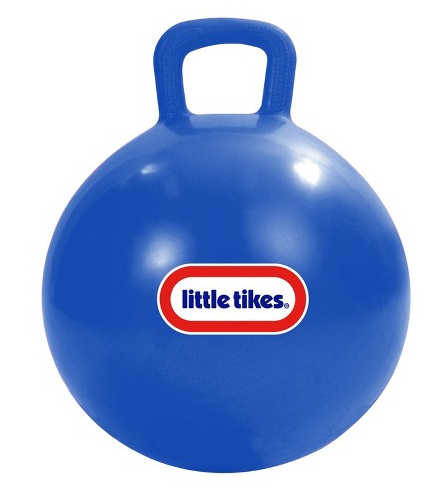 LITTLE TIKES® is a trademark of Little Tikes in the U.S.
l®1111 of Little Tikes. TTh'””‘ Used under license by Better Sourcing Worldwide, LTD.